You can open a JPG file using the "Windows Picture and Fax Viewer" and when you click on the "Save" icon, select PNG from the drop down box. Better quality and more detail with a PNG over a GIF. JPGs are still broken. I tried to upload a 7 kb jpg and the little arrows just kept doing a "ring-around-the -rosie" for 5 minutes (twice), so I just gave up. Then I found this thread and P'shopped that 7 kb jpg into a 24 kb gif. It did upload however. Go figure. Can't upload the better quality, smaller file, but can the poorer quality, over-inflated file. I can't get a profile picture to upload. Any ideas? Thanks! I believe it has to be under 100kb. I tried all those, all under 100kb. Just did it again and any of the formats worked this time. Thanks Larry. Go "File Save as" and from there you should be able to pic the file extension such as TIFF, JPG, GIF, etc. or 2 mths 19 days, or 11 wks +1 day, or 78 days, or 1,872 hrs, or 112,320 min, or 6,739,200 sec. Yeah, but that's a GIF; can you load a JPG? Still no luck on photos. I've tried just pasting them in with no luck. I've tried the little photo upload button and pasted the URL in from Photobucket. Sometims nothing happens, sometimes the photo shows up in my draft message. But when I hit OK nothing happens and I have to back out. JPG, GIF, BMP-makes no difference. Or this could somehow eventually get fixed and the thread would die. Just downloaded a GIF and it worked! 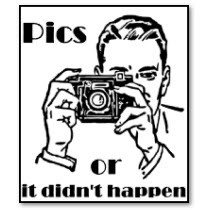 "pictures or it didn't happen" is pretty much a go nowhere post on any thread. I have a GREAT story to share about the Wehrmacht marked Browning HiPower that I carried for almost three years in Vietnam magically coming back home to me after a 45 year absence but without pics, why should I bother? Edited by Bud, 25 January 2014 - 04:57 PM. Pictures are good! It makes it like a cartoon, only about something I'm interested in. Where's that pyre guy when you need him ? <---My new profile pic is awesome. Thanks to the IT guy running(?) this site. This will never get fixed. They're too busy deleting posts to worry about the virus plaguing the forum link off Google or allow us to actually post real pictures. The fix was already posted in the Walmart thread. Seek and ye shall find. Edited by operator45, 04 March 2014 - 04:23 PM.